So in case you missed it HP has, for some reason or another, decided to discontinue making phones and tablets with webOS on them (along with some other big news about computers and such that doesn't affect me). This is, of course, right after I had posted how awesome my TouchPad is. 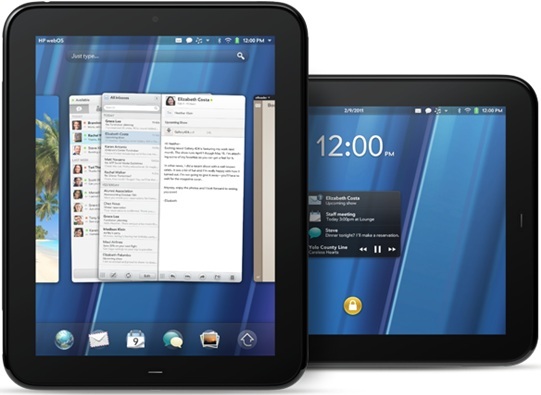 I had originally bought the TouchPad as a device to use as a sometimes substitute for my Mac, a developer tool, and in an eco-system that would include a new phone also with webOS on it. It would also do duty as a media playing device and take the job over from my aging iPod Touch. At $500 or so this was seen more as an investment for future webOS work, and I was counting on updates, applications to be added, and new hardware. Of course with HP's recent decision I felt $500 was a bit much for a device with a vague future, at best. So I returned the device to Costco (I love how easy it is to return things there), and happily went my marry way. That is until I realized that HP and their partners were putting them on a fire sale for $100 or $150! At this point I was already considering a new iPod Touch at $300, but a $150 TouchPad that could do all of the things I mentioned above, minus the webOS eco-system, and I had to get one. Again. And I wasn't the only one who wanted one. HP's website was down due to demand. Local stores sold out quickly, and other online retailers couldn't keep up with demand and quickly sold out. HP is scheduled to get more stock in, but who knows how many back orders they have already. I was lucky to find a merchant on Amazon blowing them out and am not constantly refreshing my order page hoping it changes from "Shipping soon" (since late yesterday afternoon) to "Shipped" that way I can feel pretty certain that I have one coming. Forum threads were on fire as people were in search for TouchPads. It wasn't lost on many that for those looking for TouchPads it felt like an iPad launch day with all the scrambling. It's estimated that HP has some 300-350 thousand new TouchPad users, and is projected to have some 1 million users by the time stock dries up. That's a good sized user base that is trying out the webOS goodness. I can only hope this leads to an HP reversal (very very doubtful) or some renewed interest by some other manufacturer. Either way, HP is now probably making it's goals, so far as units sold.